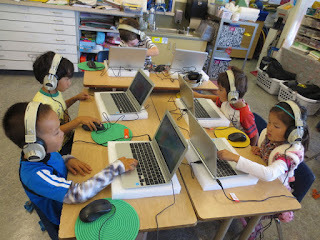 This spring, students in schools throughout SFUSD will sit down in front of computers, deep in concentration. But these headphone-wearing students are not rocking out to music, playing games, or even using educational websites or writing reports. They’re taking tests. Yes, those end-of-year pencil and paper tests you might remember from your own school days have joined the digital age. California is one of 14 states using the internet to administer the Smarter Balanced end-of-year tests. As part of the CAASPP program (California Assessment of Student Performance and Progress) launched in 2015, California school districts administer summative assessments to students after 66% of the curriculum has been taught. About 26,000 SFUSD students in grades 3-8 and 11 take the computer-based Smarter Balanced assessments for English Language Arts and Mathematics. And students in grades 5, 8, and high school also take CAST Science, a computer assessment using the new Next Generation science standards. These tests use a remarkable application, called computer-adaptive-technology (CAT). The assessments actually change as each student proceeds through the test, displaying questions personalized for each student’s own precise level. Though each student has a customized test experience, all Smarter Balanced assessments are based on the common-core state curriculum, providing students – and schools – with far more accurate information for each student’s achievement levels. Smarter Balanced assessments are a world apart from test booklets and pencils of previous state testing. English Language Arts assessments use “performance tasks,” with students writing essays as a response to short videos, audio clips, as well as reading passages. Math performance tasks focus on interesting real world problems, with deep levels of complex thinking. As an additional bonus, computer-administered tests allow students to take advantage of powerful digital tools, such as hot text, drag and drop, and zoom. The CAASPP program is designed for a diverse group, reflecting all SFUSD students. For students with disabilities, CAASPP tests offer a large selection of digital supports and accommodations. And for students who are not yet proficient in English, translation supports are available in 18 languages. State testing may never be exactly enjoyable, but now through June 6, SFUSD students are getting the chance to show just how much they’ve learned. And judging from how hard students have been working on CAASPP testing, our students have learned a lot.